In Loveland, Colorado there was little love shown to Captain Alex Evans, U.S. Army Special Forces who single headedly saved the entire world and the future of mankind by lobbing a MK140 High Explosive Fragmentation Grenade with flawless military precision into Pandora's Box itself! His costly mistake however was to do so on school property putting the lives of civilians and schoolchildren at risk. At least this is how it may look to poor little Alex Evans if he could even understand why he was being suspended from school. But because you're SEVEN YEARS OLD you can't fathom why you'd be punished for being a hero! Confused? Let me elaborate. Evans is a 2nd grader at Mary Blair Elementary School and he was suspended from the school because he violated the school's insane rules against the use of weapons - either real or imaginary. That's right - imaginary. The boy was playing a game during recess and threw an imaginary grenade into a make-believe box with pretend 'evil forces' inside. Evans explained to FOX31 “It’s called ‘Rescue the World,’ I pretended the box, there’s something shaking in it, and I go ‘pshhh.’" as the boy widens his arms as if to simulate an explosion “So nothing can get out and destroy the world. I was trying to save people and I just can’t believe I got dispended,” he added, obviously not even able to pronounce his punishment - something that the school should probably be more concerned with than trying to act as totalitarian 'thought police' restricting imagination. Mary Blair Elementary lists “absolutes” designed to keep a safe environment. The list includes absolutely no fighting, real or imaginary; no weapons, real or imaginary. Alex Evans did not even throw a physical object [like the dangerous weapon carried to school by Melody Valentin] or make any threats against anyone [like the 5-year old terrorist did in Pennsylvania] but the Orwellian school authorities insist he broke a key rule during his pretend play. 6 year old suspended for pointing a finger like a gun. 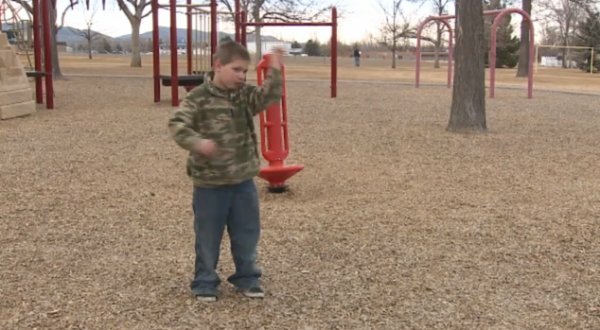 Pair of 1st graders suspended for playing cops & robbers with finger guns. 5 year old makes gun gesture and says "bang" = 2 day suspension. 5 year old threatened with suspension for making gun shapes with Legos. I was really hoping at least one of these stories linked to The Onion, but no, all real. If I had been subject to these 'laws' when I was at school, I'd have been expelled as opposed to suspended as I'm sure a lot of folk reading this would be. I'm not unaware that some children of these ages are capable of crime and can wield dangerous weapons. I also acknowledge that every school is within it's rights and certainly even has a responsibility to ensure that it's teachers or students can't be in a position to cause harm or be harmed by one another. It's perfectly reasonable for school authorities to act and punish if physical harm is done to faculty, students or property but the act of prohibiting the development of simple thought and imagination is the most disturbing thing I've read in quite a while [and I read ramblings by Glen Beck earlier in the week!]. The fact that these rules are being enforced on 5-7 year olds in learning institutions in the 21st century is unfathomable and would only be conceivable to me in a Dystopian science fiction movie. The world is a dangerous place. Educate the little brats on what to do if they encounter a real weapon and they just might listen. Yes there must indeed be measures in place to protect children but they must not come at the cost of their childhood.